Norah Head, Australia, 40cm x 50cm, oil on canvas. Icart Point, Guernsey, 25cm x 50cm, oil on canvas. I love painting small art works, they are great especially if you are a beginner. You can paint them more quickly, they are good for practicing your painting techniques, they make great little paintings, they are easier to sell and you can use them for colour studies for bigger paintings. How to Paint Mountains in the Great Outdoors - Painting 'En Plein Air'. Have you ever tried painting outdoors on location? Let me tell you it's really good fun, it's challenging but it gets you outside and it really improves your painting skills especially if you're a studio painter. Recently I took my paints and easel on a little road trip to Fiordland National Park in the South Island of New Zealand. Fiordland is a very mountainous region of New Zealand and is perfect for painting outdoors on location which is also known as painting 'en plein air'. Painting seascapes is one of the subjects I love to paint most. Every so often I visit the island of Guernsey which is the place I was born. Guernsey has amazing coastline, dramatic cliffs and the wild Atlantic Sea, the island is located in the English Channel and is very inspiring for coastal scenes. In this step by step painting demonstration I will show you how to paint this seascape of a little place called Port Soif, located in the west of Guernsey. I love painting mountains and one of the great things about living in New Zealand is there is plenty of them to paint! 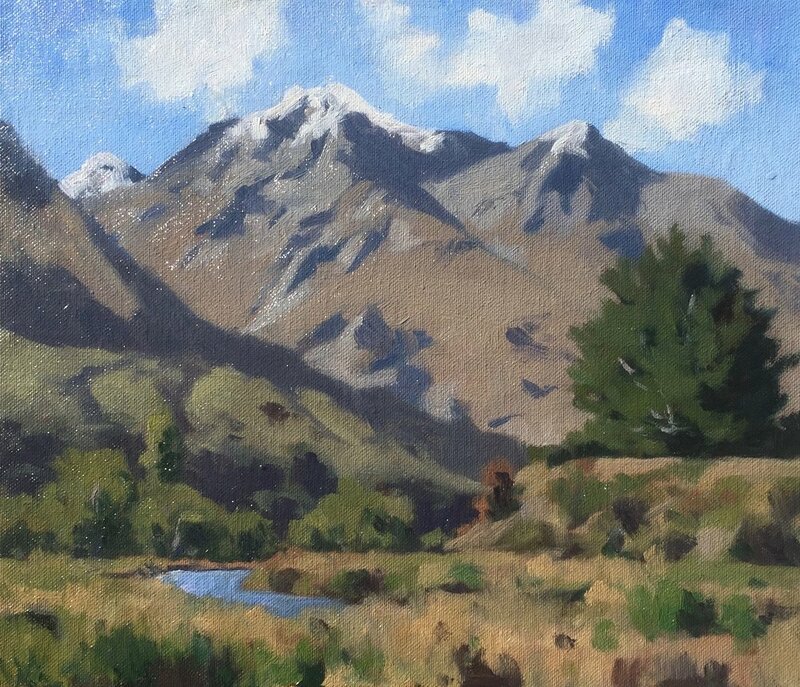 One of my favourite mountains to paint in New Zealand is Mt Talbot and Mt Crosscut which is located in the Fiordland region of the south island. In this step by step painting demonstration I will show you how to paint this mountain landscape. Painting breaking waves is fun!!!! ...and you can create some awesome seascapes where a breaking wave is the hero of the painting, add rocks, white water, spills, clouds and light angles and you can create some very engaging seascapes. This seascape painting which I will show you how to paint was inspired by the coastline of Wellington, New Zealand, where the sea can be pretty rough when a southerly weather system is passing through...but at the same time provides excellent subject matter for seascape paintings. In this step by step painting demonstration I am going to show you how to paint this mountain landscape shown in the picture below. This landscape painting is based on Mount Talbot in Fiordland, New Zealand. It is a huge mountain range which ultimately leads to the epic Milford Sound, this is a great subject for landscape painting. Improve Your Landscape Painting Skills...Paint Outdoors!!!! I love landscape art, especially traditional realism painting and I have been painting landscapes for many years. Whilst I paint a lot in my studio one of the things I love to do is paint outside on location in the great outdoors. This is called painting ‘en plein air’, which is a French phrase meaning to ‘paint outdoors’. Plein air painting is not only thoroughly enjoyable, and great for the mind, body and spirit, but it also helps immensely with improving your studio work. Plein air painting teaches you to really look at the landscape, its forms, colours and tonality. It teaches you to loosen up your painting technique, improves your use of colour and understanding of composition. It also teaches you to paint quickly as the light and weather conditions are always changing. In order to create an engaging seascape first of all we need to plan our picture so we can determine what the painting is about. Depth within a painting can be achieved by having strategically placed focal points and effective use of colour to create atmosphere and space within the painting. In order to create the story of this painting I decided what elements I wanted in the scene and where I wanted my main focal point to be. Before I even began painting this picture I compiled many pencil sketches in order to plan the composition so I could see what would work and what wasn't going to work in the picture. This is essential so I don't run into problems with composition issues later on when I am painting the picture.